The morning of 5th Oct dawned with us ready to bid goodbye to the beautiful Mara Sopa Lodge, the amazing Maasai Mara and its colourful people. 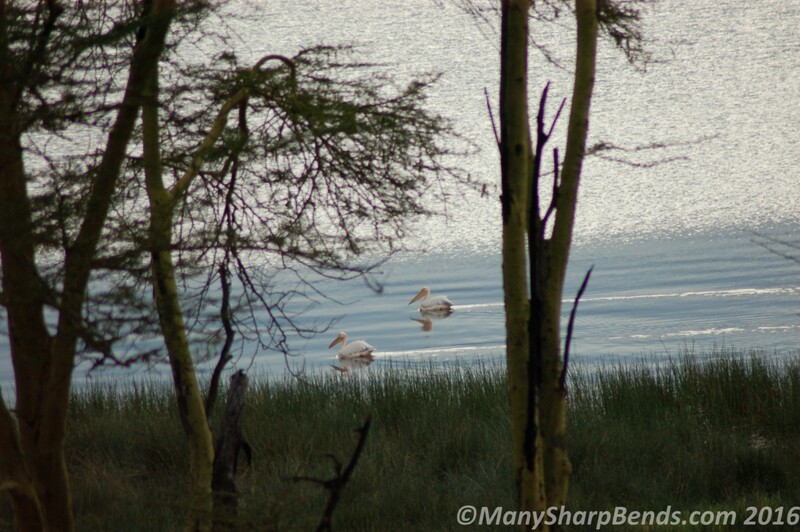 Our next destination – the Lake Nakuru National Park located around lake Nakuru, the largest of the soda (alkaline) lakes in Kenya’s Rift Valley lake system which is designated a UNESCO World Heritage Site (natural) as well as a wetland of international importance protected under the Ramsar Convention. We reminisced the large soda lake we had most recently visited, the Mono Lake in our Great American Road Trip about 3 months ago. Richard, our guide & driver tells us it will take us 5 hours to get to our destination, which seems reasonable for the 250 km distance. 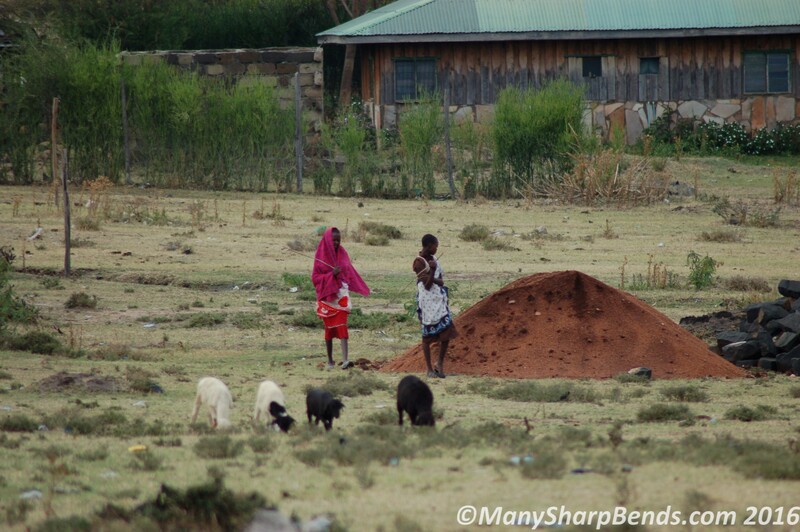 But we know it will be longer given the road (non-existent) out of here until the town of Narok. We are certainly not looking forward to the bone-rattling start to our journey! Since it had rained every single evening since we arrived, Richard decided the main “road” was best avoided and took us through some interior village tracks, which surprisingly were a lot better! Two barriers put up by the locals who expected a payment for usage of these tracks were managed skillfully by Richard by offering food to the villagers from our Sopa lodge stock :). A little over 3 hours and we reached Narok right in time for lunch. The next part of the ride was much more comfortable and we napped while Richard negotiated the queues of trucks that seemed to appear at regular intervals. Kenya is visibly a nation under construction with a whole lot of construction material being moved around by road. 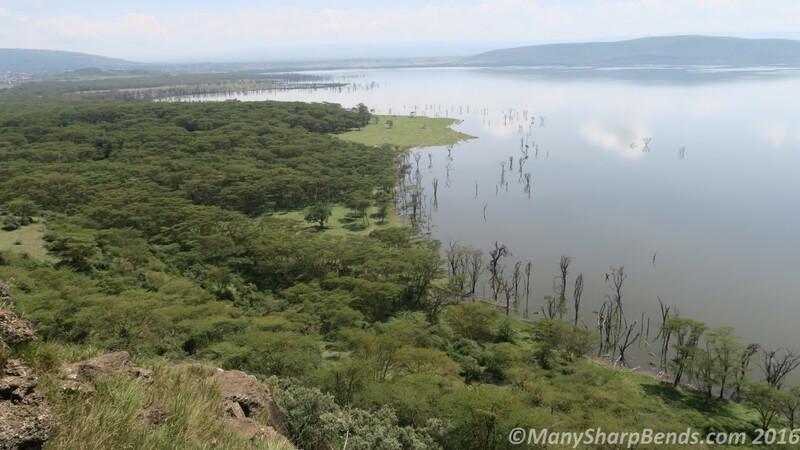 We passed two lakes Kenyan Rift Valley lake system of the enroute, the first being lake Naivasha, a freshwater lake and the second lake Elementeita, a soda lake. As we approached Nakuru town, we learnt that our wait to get to Lake Nakuru Lodge was going to be longer than we anticipated because we could only enter the park through the main gate located at the northern end and not the eastern gate that was right next to the lodge and the first one on our way. Because entry permits to the park are only issued at the main gate!! And that meant an extra 45 minutes on the road through Nakuru town traffic for us. 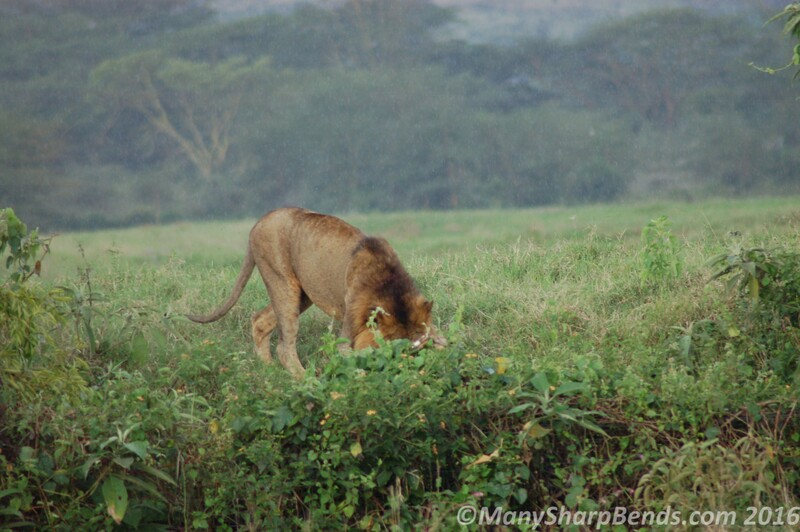 But all’s well that ends well; the reward for us was a short and sweet evening safari that started off with the sighting of a lion as we made our way down to the lodge! 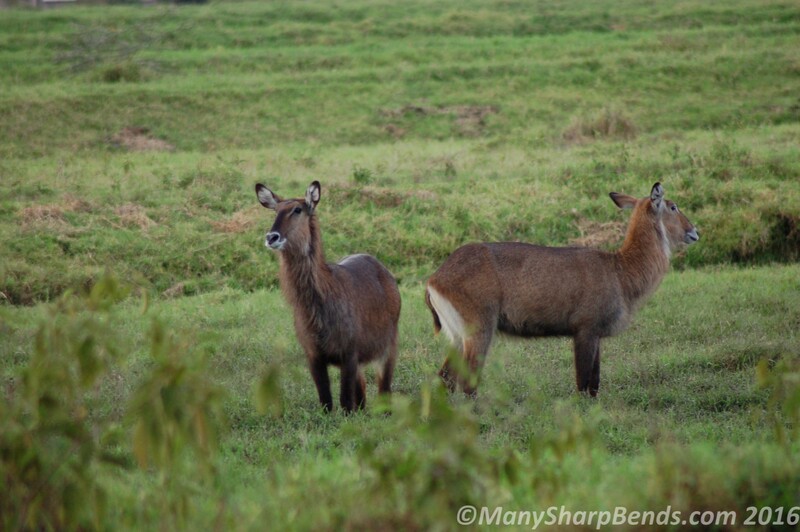 What a beginning to our Nakuru evening safari! 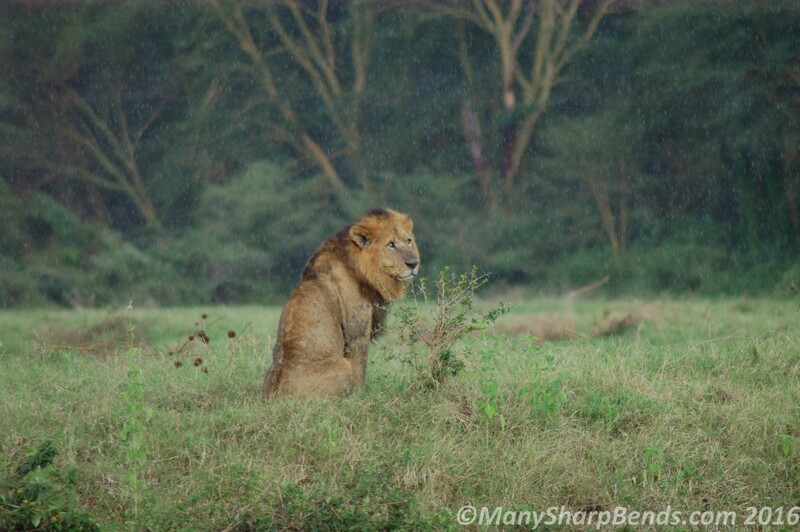 And then came the evening rain that had marked each day of our Kenyan safaris so far. Heading off to find shelter from the rain, end of show! The drizzle that didn’t last too long and we continued looking out to spot birds and animals. 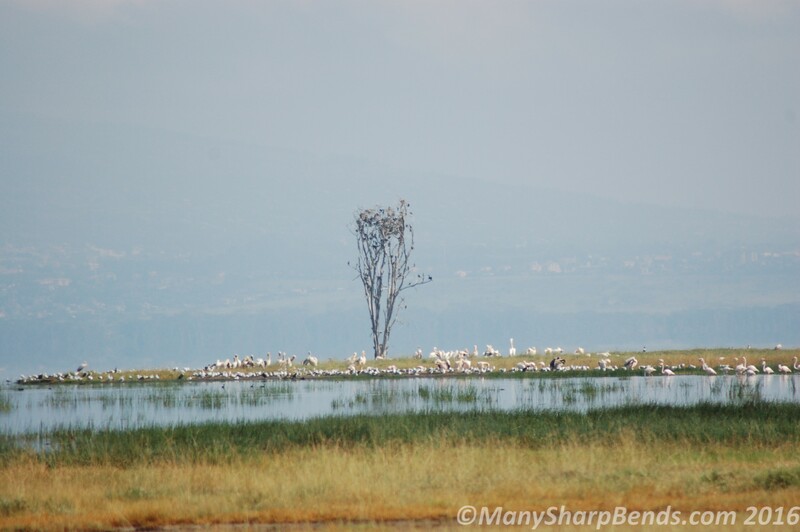 Lake Nakuru is most well known for the millions of flamingos that congregate in its saline waters which provide the ideal environment for growth of algae. The algae is a primary food source for the flamingos and creates a food web that sustains them and a variety of other birds including great white pelicans. 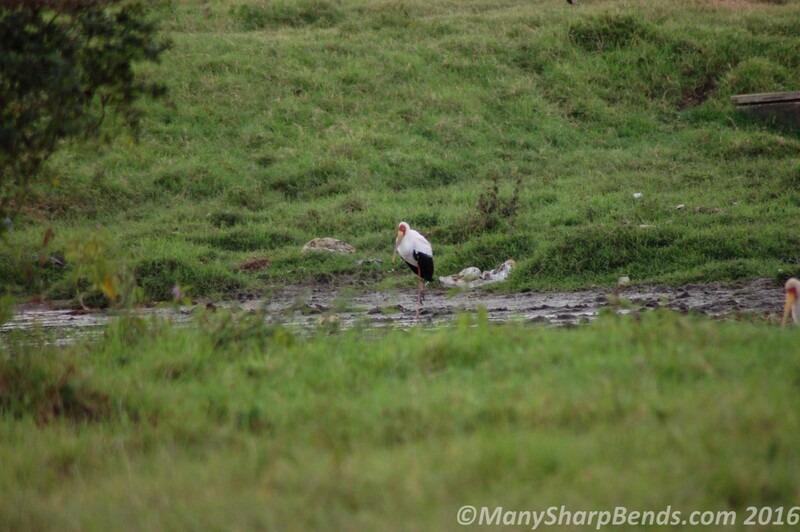 In recent years, this single most important foraging site for the lesser flamingo in the world has been seeing decreasing numbers of these birds due to increase in water levels that has reduced the salinity and hence its productivity. The cause of the water level increase is not completely clear and could possibly due to a combination of human-induced factors such as deforestation, soil degradation and urbanization, as well as natural causes such as tectonic plate shifts. Whatever the cause, the result is clearly visible; we did not see any flamingos that evening. Plenty of other attractions do abound in the park and here are some we saw. 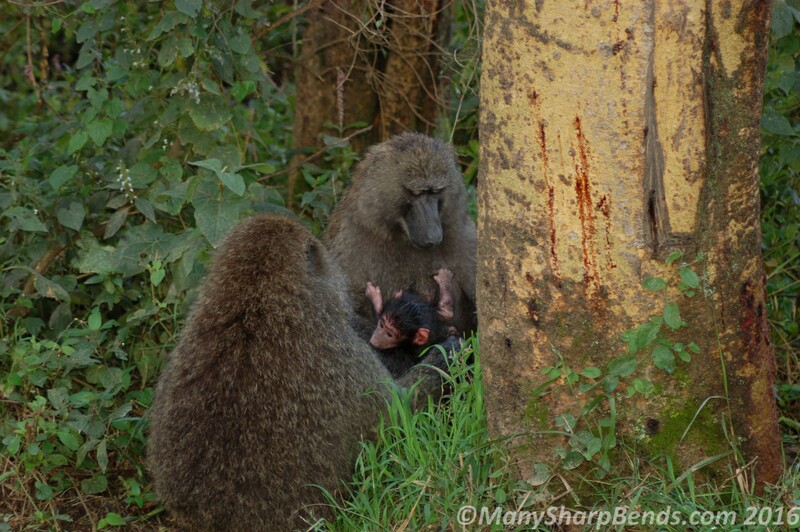 This young Olive Baboon clutches its mom with all its might! 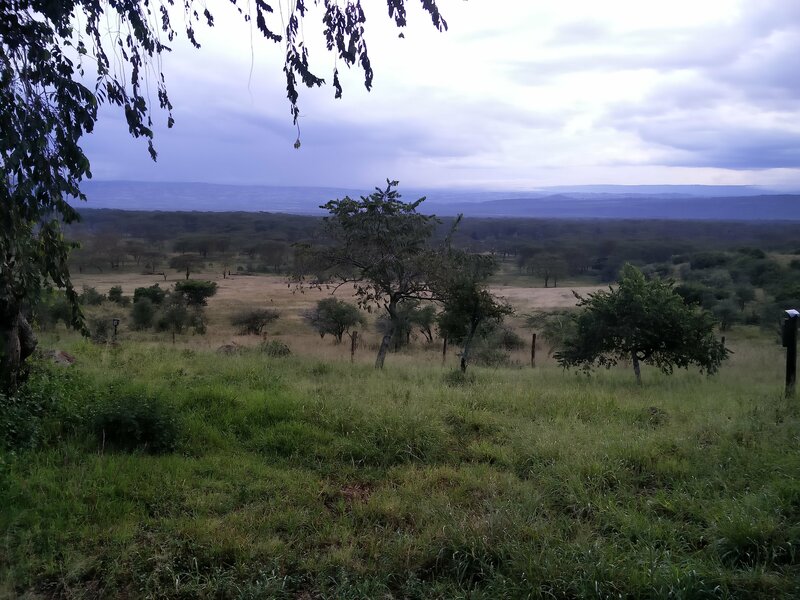 We arrived at the beautifully situated Lake Nakuru Lodge just before dusk and could enjoy a few moments of the stillness and peace in the balcony. 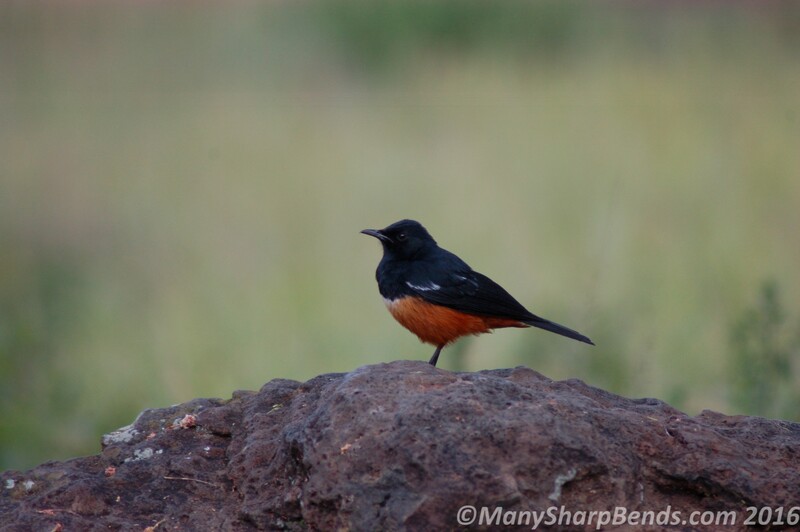 The next morning we woke to the chirping of birds and found some beautiful ones celebrating the light of dawn. 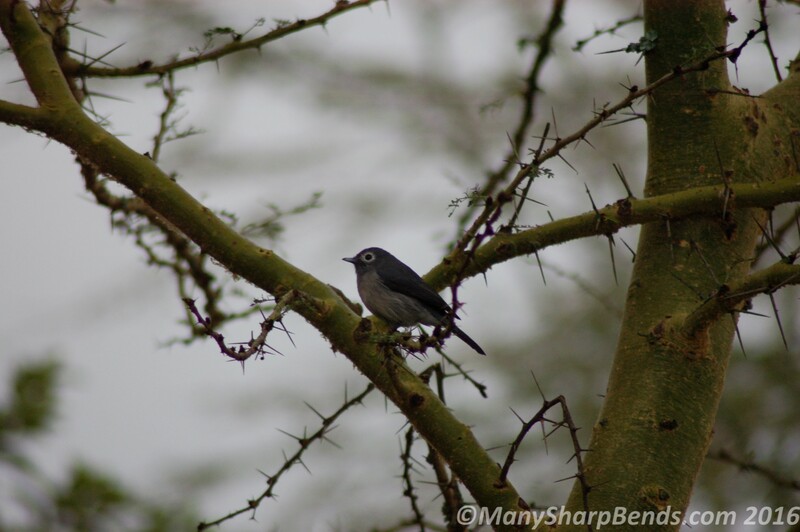 The most fascinating for us were a bunch of crested, long-tailed acrobatic birds that would sometimes hang upside down to get to some fruits on a nearby tree. 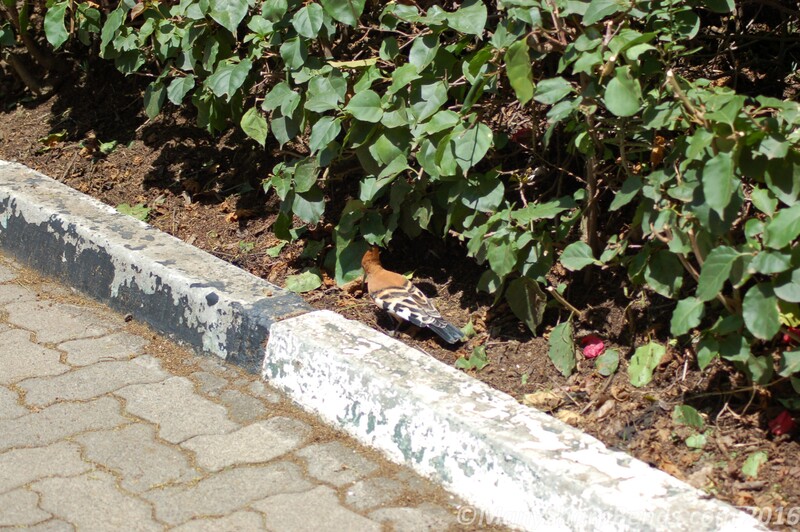 We later learnt from Richard that these were Mousebirds. 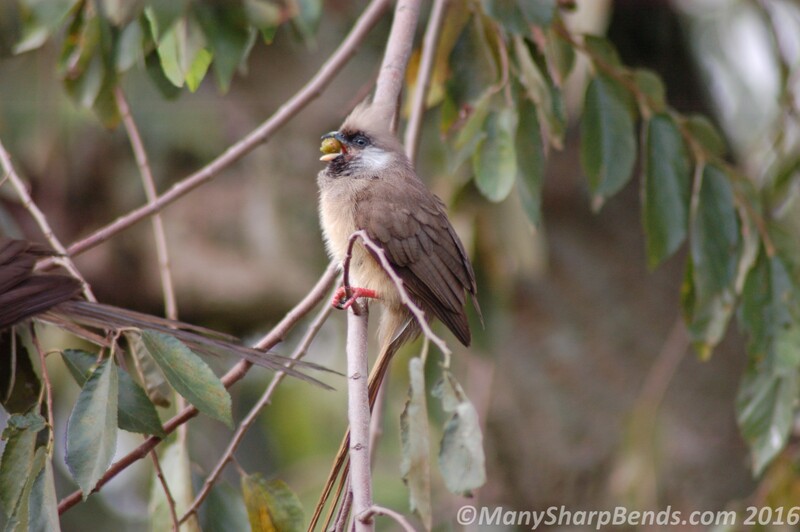 Speckled Mousebird, quite an acrobat! 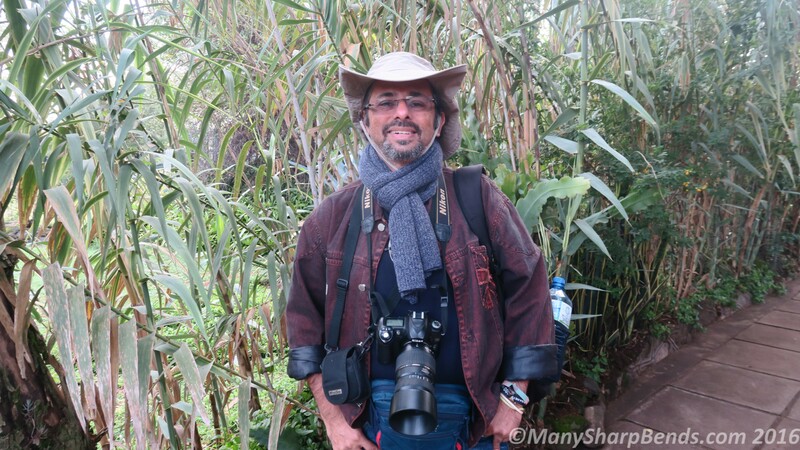 The MMM World Trip Mastermind is all set for the morning safari! 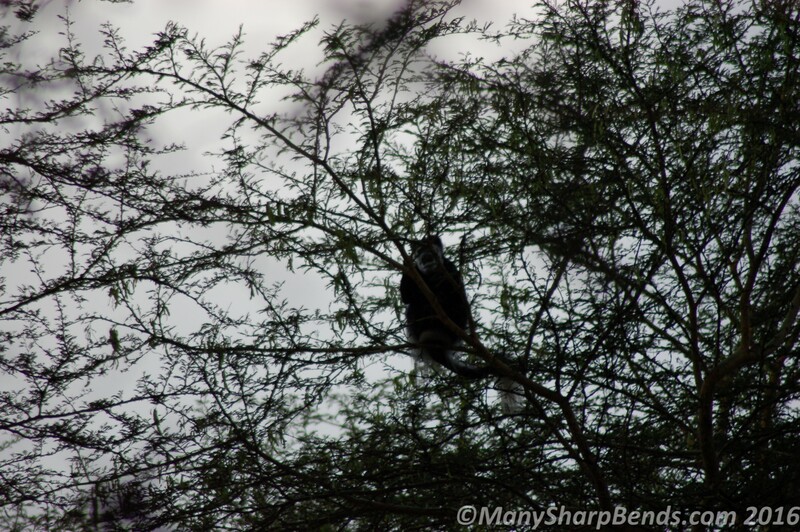 At breakfast we watched baboons wandering the grounds adjoining the lodge. And set out on our safari with fingers crossed that we get to see rhinos, flamingos, Rothschild’s giraffes and some tree-climbing lions. 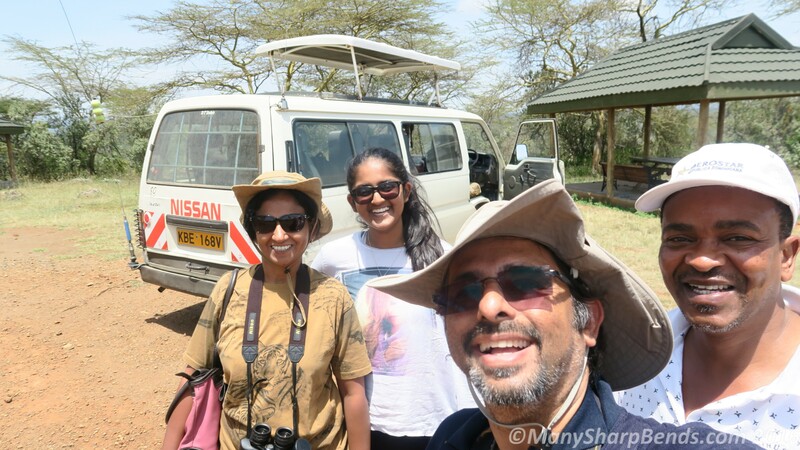 We were in luck, with Manish spotting a rhino pretty soon. It was an African black rhinoceros, a critically endangered species; we could clearly see its two horns through our binoculars. 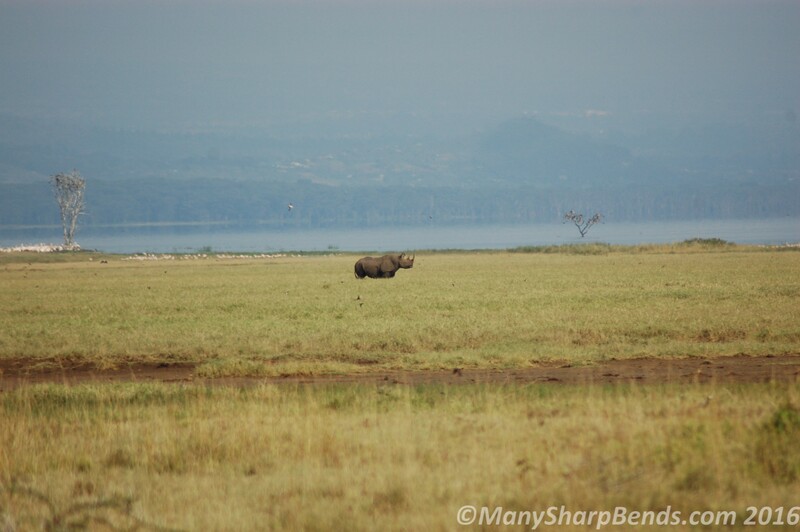 As we looked at the rhino to our hearts’ content, Richard pointed out that there were flamingos visible in the distance along the lake’s shoreline. So we moved forward to catch a closer look. We went as far as we could; the tracks that would have taken us closer are no longer accessible, having been submerged by the rising water in the lake. 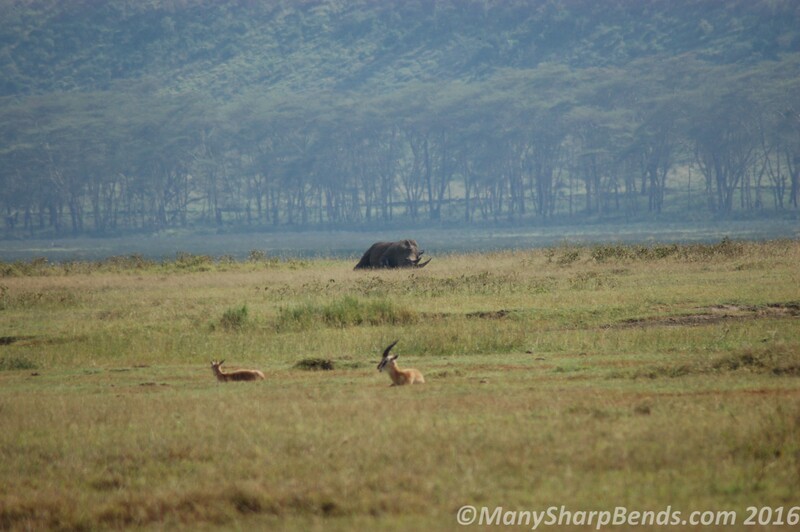 As we watched the flamingos, Richard thought he saw a black rhino sleeping in the tall grass. 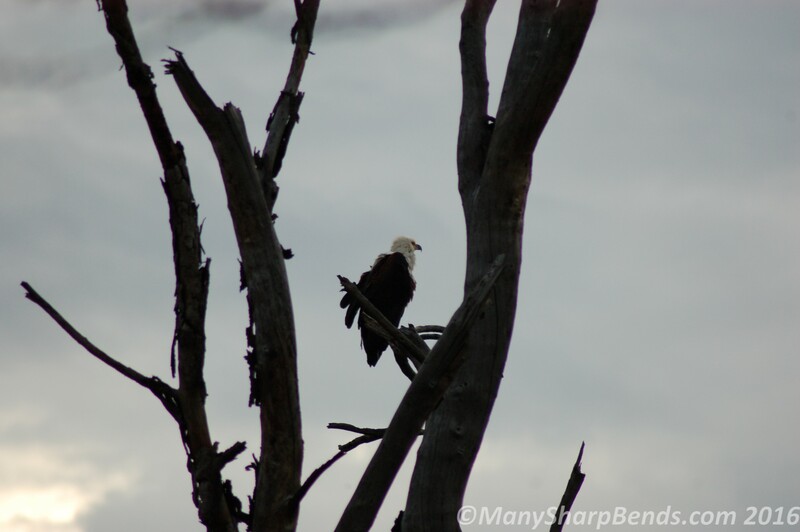 We looked through the binocs and sure enough found the big guy/gal! Yet again we were all admiration for how good he was at spotting with his eyes while driving! Our second black rhino, we are in luck indeed ! 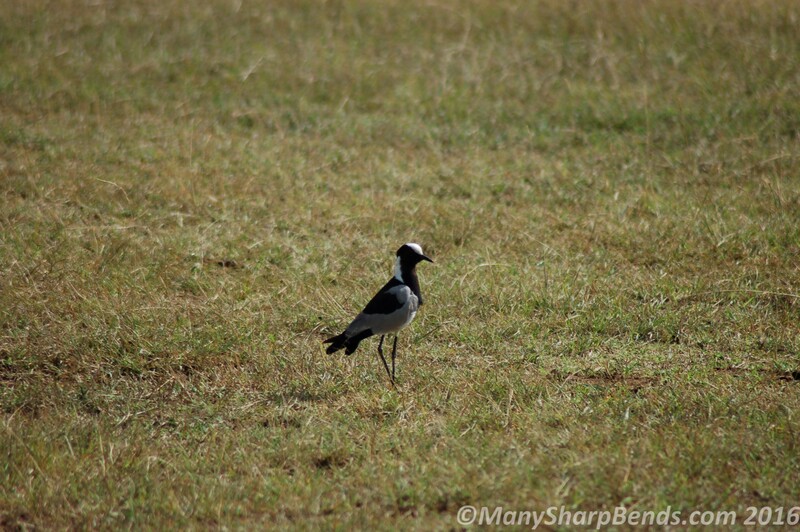 While the flamingos may be the star attraction for most visitors, Lake Nakuru is a birder’s paradise. 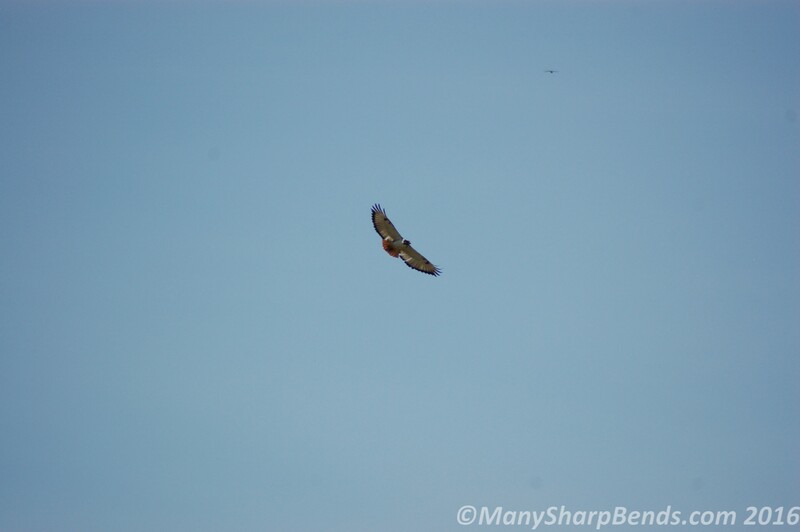 We spotted quite a few birds of prey on tree-tops and in flight that morning besides lapwings on the ground and bunches of the brilliantly coloured superb starlings that are common all over Kenya. 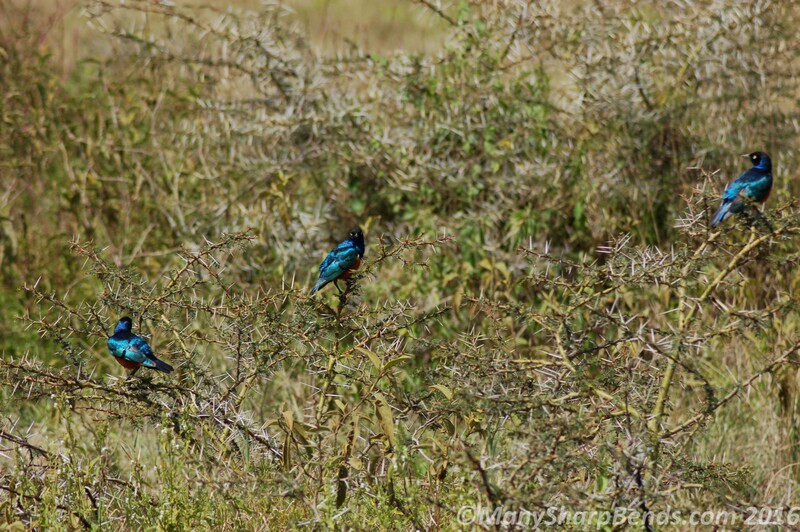 The ubiquitous Superb Starlings we think are named very aptyly, what superb colours that shine in the sun! We are on the lookout for lions on trees because the lions here we have read are a rare tree-climbing variety. There aren’t too many of them, the number estimated being 50 or so across the park, but for a park of this size, it is a good density. 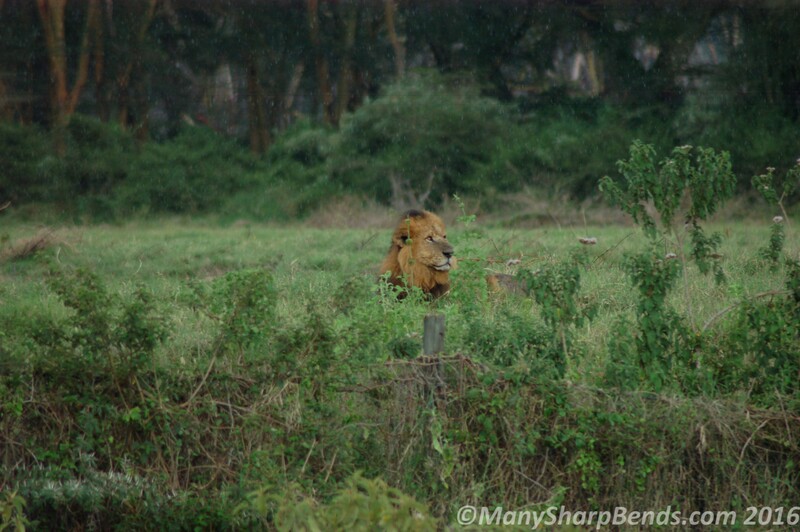 Richard suddenly stopped and said “look there is a lion there”. 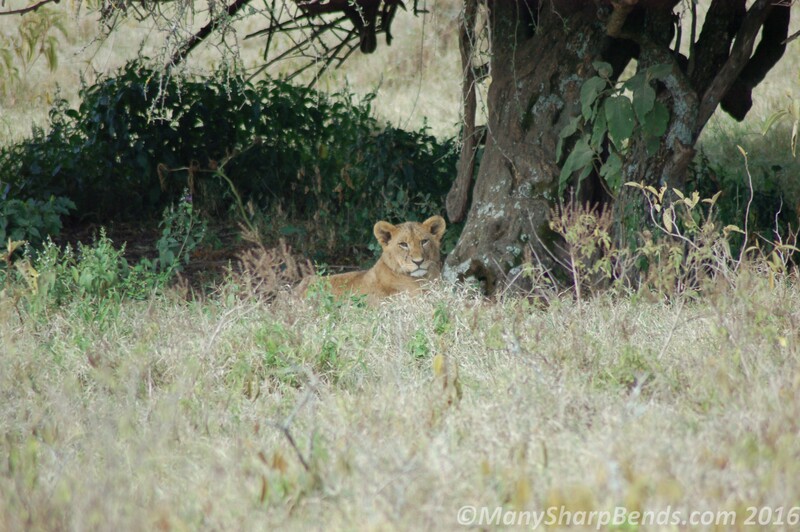 Excitedly we peered under the shade of a short tree and sure enough saw a lioness. 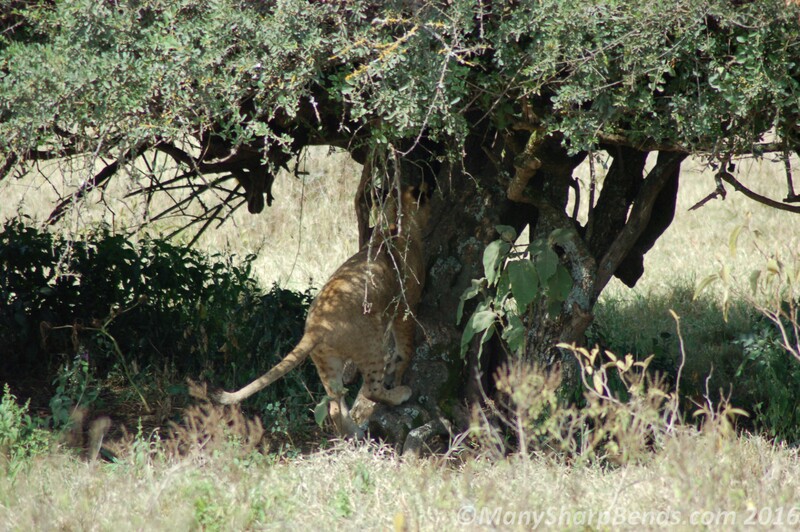 There’s the lioness, but can she climb a tree? She seemed content just resting under the shade. 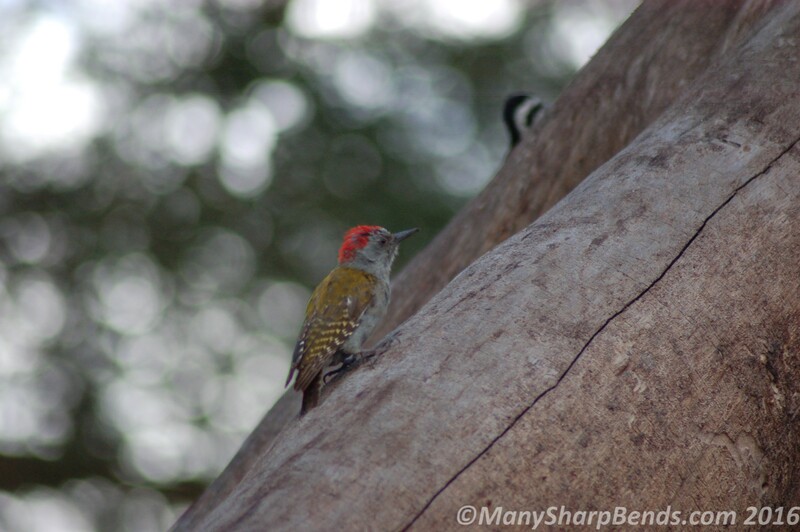 We waited and watched .. and soon enough she stood up and in a flash was on the tree trunk with a little jump. Manish managed to get a few clicks of her climbing up before she completely vanished from sight, hidden by the thick foliage! And so we figured we had been looking up the wrong kind of trees, it was not the taller ones but the short stubby ones with thick stems that the lions climbed. So that’s the kind of tree she climbs, what a lucky timing for us! Pinching ourselves so we knew we weren’t dreaming, we drove on past the airstrip of the park (these seem to be there in every national park and reserve for small propeller aircraft providing a rather expensive way of avoiding the rickety road journeys!). 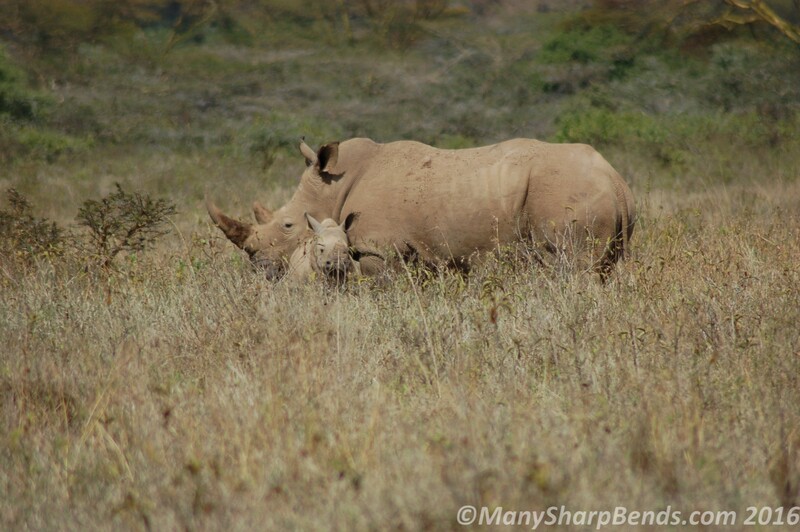 A couple of vans stopped ahead of us meant there was something interesting and peering through the grass we found a white rhinoceros there. And then we figured there was another tiny version of it right next to it, it was mom & baby! Their colour is not really white, the name owes its origin to the mistranslated Dutch word “wijd”, which means “wide” in English. The word “wide” refers to the width of the rhinoceros’ mouth. In contrast the black rhino has a narrow pointed mouth. After all these sightings, it seemed only right that the next in line were a number of Rothschild’s giraffes, also known as white socks giraffes, an endangered species introduced into the park for their protection. 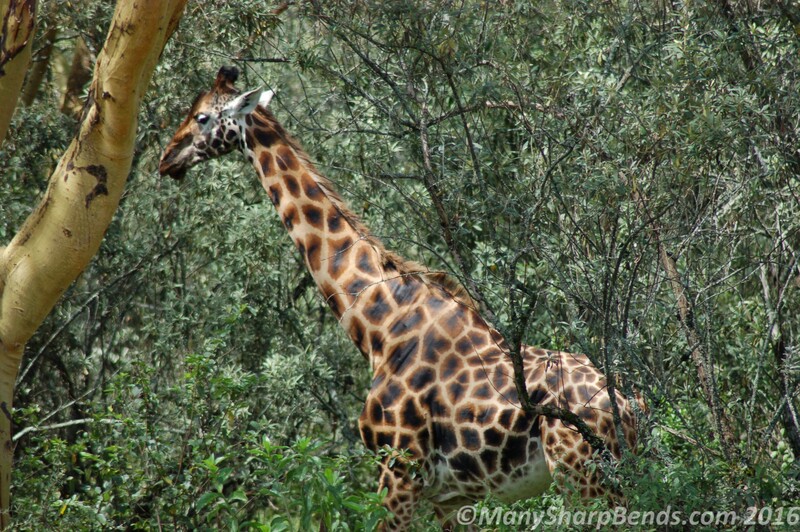 These giraffe with their spots not extending below their knees and more pronounced patches are different from the Masai giraffe. 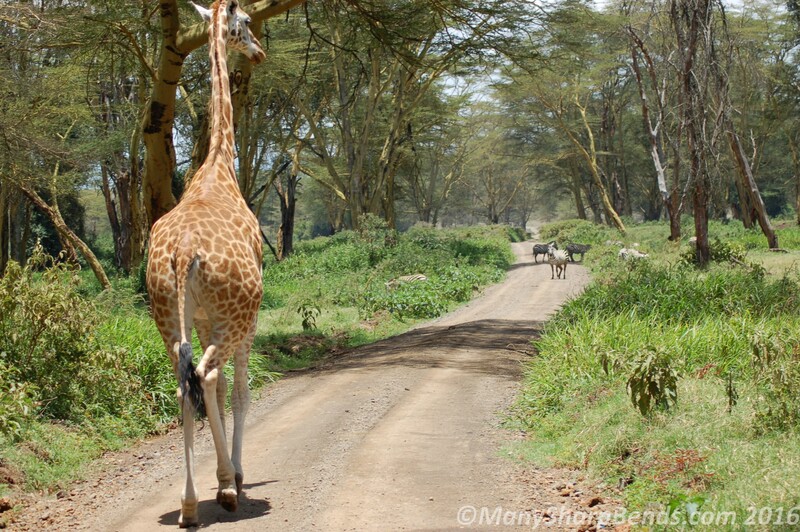 A “white socks” giraffe walks ahead of us and further up you can see zebra crossing! 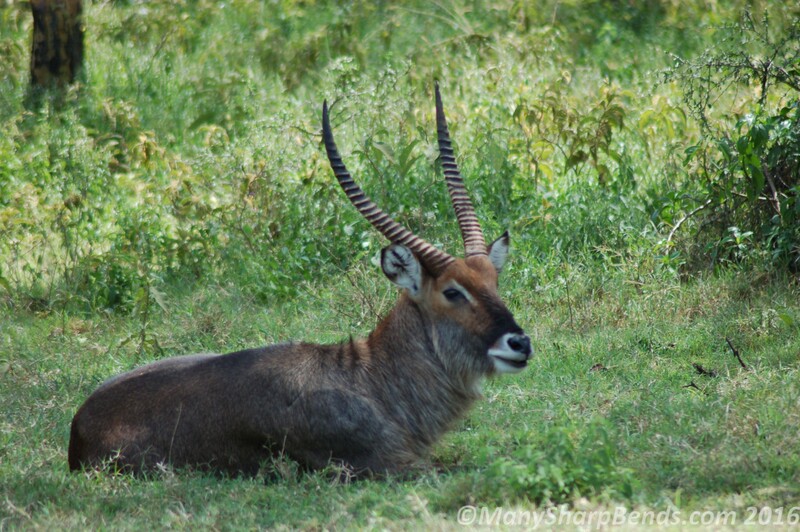 And resting in the shade we see this beautiful male waterbuck, followed by a pair of really small antelope that quickly darted away. 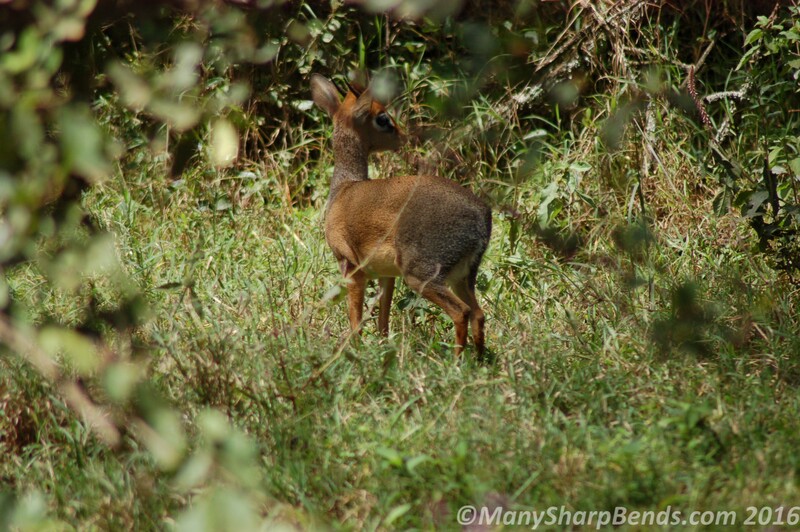 Richard informed us that they are the the smallest antelope variety and called dik-dik. 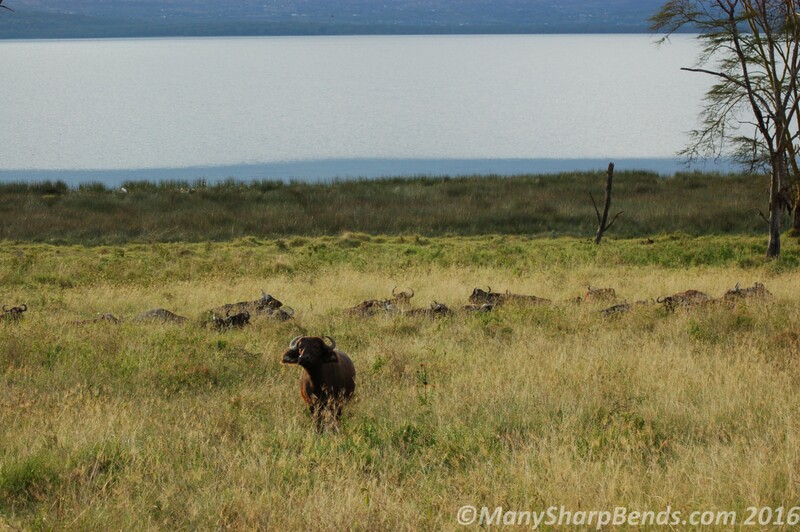 We climbed uphill to Baboon Cliff, a lookout point to get a view of the entire lake. 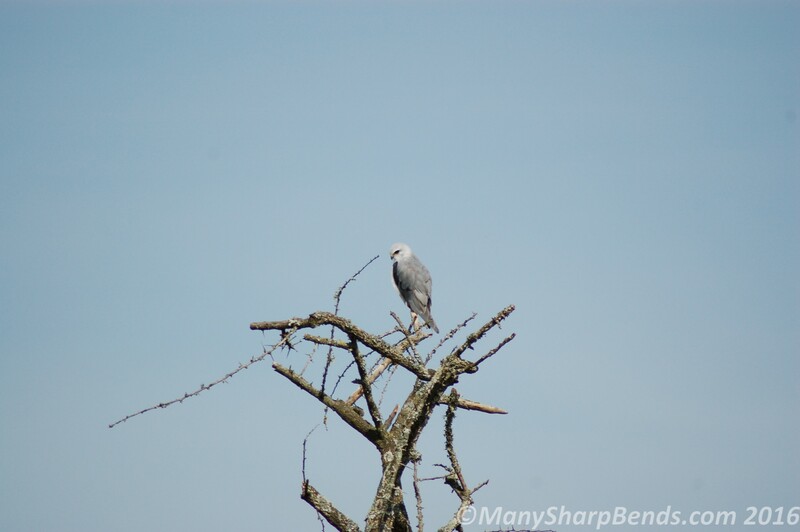 And another one called the Out of Africa lookout. 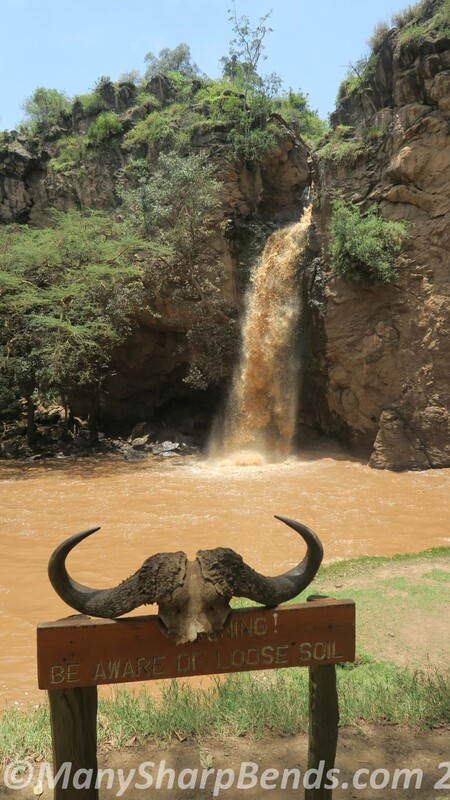 Final stop before heading back to the lodge for lunch was the Makali Falls, one that looks really brown carrying the red soil from upper reaches. With our guide Richard to whom we owe our incredible Kenyan experiences! It was a satisfying lunch in a beautiful setting overlooking the park expanse, the only slight put-off being the stiff upper-lip “management” rule on your own water being termed as an “outside drink” that is not permitted in their restaurant! We were all set to head on to Nairobi for an overnight stay before embarking on our next long journey to the Amboseli National Park. 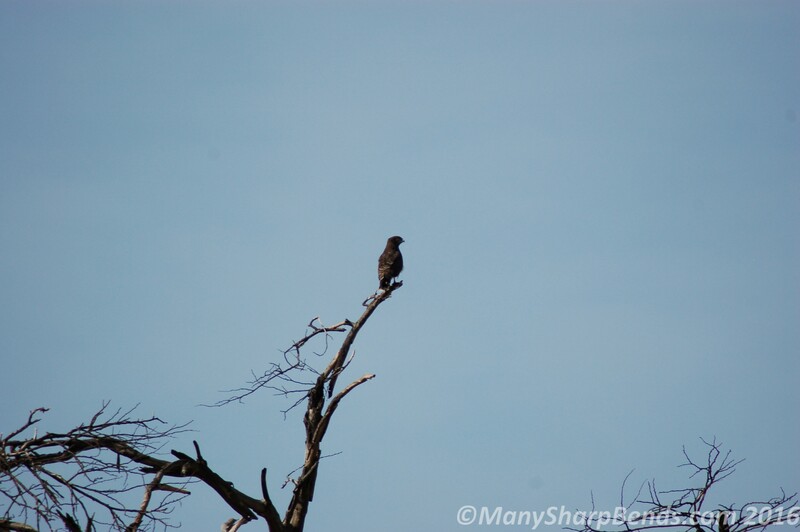 As we pulled out of the lodge, Richard pointed out an African Hoopoe that seemed to have come to bid goodbye to us! 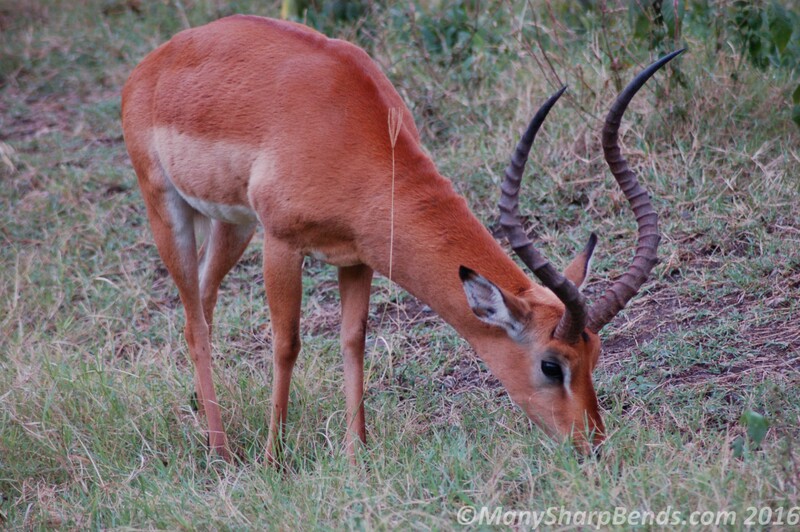 Thanks for reading, will be back soon with our Amboseli experience. Please do check out our daughter Mihika’s blogs on how she is viewing the world at www.iammihika.com.